Alternatives' (Re)Shape Chicago Solutions Challenge gives teams of young people the opportunity to shape solutions to address real issues challenges. 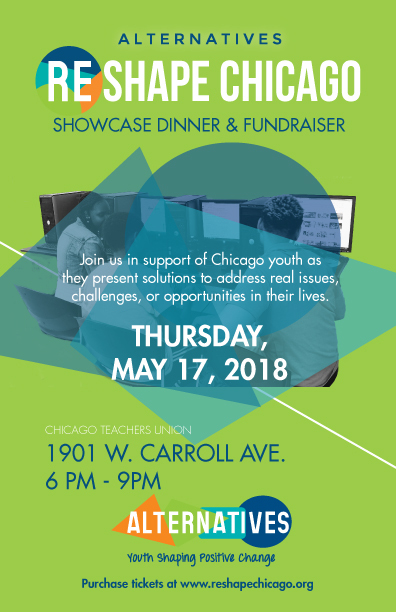 The first (Re)Shape Chicago dinner will take place on the evening of Thursday, May 17, 2018, at the Chicago Teachers Union – 1901 W. Carroll Ave. This event will feature youth presentations, dinner, drinks (beer and wine), and a silent auction. The Silent Auction is LIVE! Click here to view and bid on items. You do not need to be present to win. Parking: Guests can use the parking lots on Damen or Wolcott. No parking in the South lot on Fulton. Cocktail or business attire recommended. Click here to learn more about (Re)Shape Chicago.